Well 2 1/2 weeks ago I made the big step to join Weight Watchers again. Was I in the right frame of mind, god no. But I did it for several reasons..
1. My Mom is not too well and has been told one of the only things that can help is to loose weight. 2. My hubby is getting very upset about his weight gain and lack of exercise. 3. I do hate the way I look. 4. I want to get pregnant again but at this weight it shall be a problem. So I went and I did not set myself any goals, well strangely I found the first 2 weeks quite ok and on the massive upside managed to loose 7 1/2 pounds, I know I was so pleased. But then this week hit, week 3 has always been my problem week with every weight loss programme in the past and this time I seem to be on the same cycle. I have felt hungry all week and I know I have cheated with my points ( although my head keeps lying to me), so as I wondered around some blogs today trying to decide what to do I came across NotSupermum. 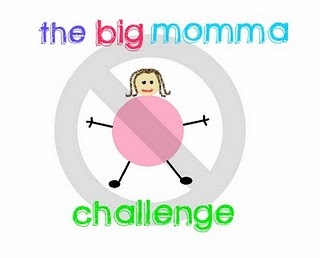 She has set herself a weight loss and healthy lifestyle challenge on her blog called ‘The Big Momma Challenge‘ and has asked people to join in if they would like, its nothing taxing, just set yourself a couple of goals for the week and then be brutally honest on your blog. I really liked this idea, not only can I still keep on at weight watchers but writing about it I am hoping will make the embarrassment hit home and stop me lying to myself. Not only that but I think it shall help me on an emotional level, not only to talk about my food issues but also as many of you know I was thinking of giving up my blog and this gives me a purpose to keep it going. So if like me you would like a little support come and join in and help each other out. I shall be back on Tuesday after my weigh in, with my results and my targets for the 1st week.